Aztec Student Union may well be the first LEED-platinum certified student union in the country, thanks to several sustainable construction elements. Installation began on one of those elements last week — the radiant heating. 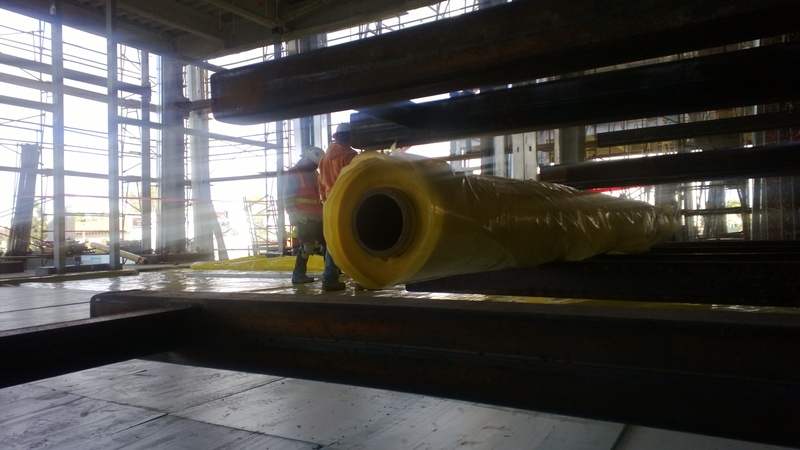 Crew members start the installation of plastic tubing for the radiant floors in Aztec Student Union. The U.S. Department of Energy defines radiant heating as “the delivery of heat directly from the hot surface to the people and objects in the room via infrared radiation.” If you’ve ever felt the heat from the oven or stovetop from across the room, you’ve experienced radiant heating. Crew members have taped off areas where radiant floor installation is taking place. Here, the floors have already received a layer of insulation. In construction, radiant heating is often delivered through walls or floors. 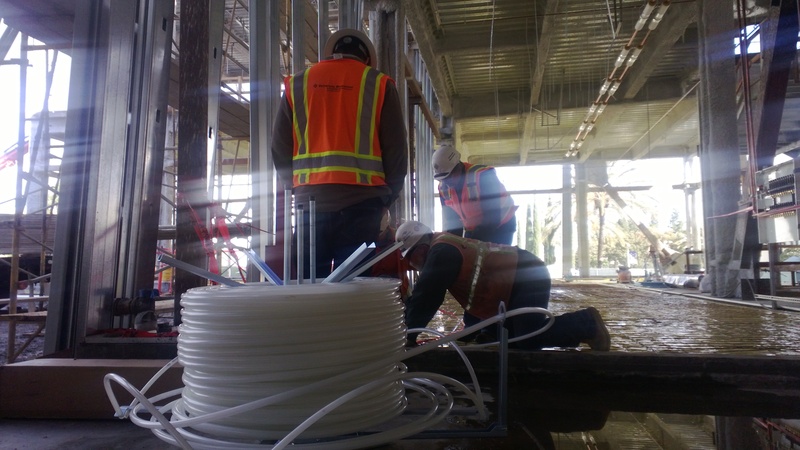 In Aztec Student Union, radiant floor heating, also known as radiant floors, will be used to reduce reliance on the building’s heating, ventilation and air conditioning (HVAC) system. 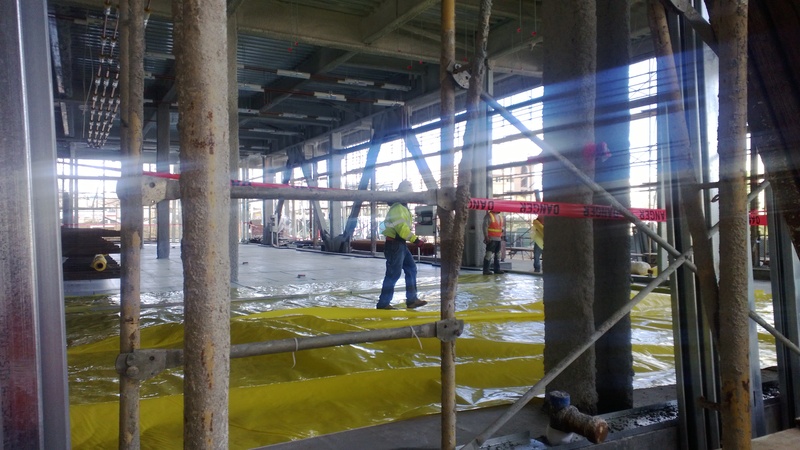 Crews have laid down a layer of plastic sheeting for the radiant floors in the cafe/dining areas on the first floor. The radiant floors in Aztec Student Union will be built on the already-poured and -cured concrete decks, or floors. Over that, crews installed insulation, then plastic sheeting, then a wire mesh and, finally, coiled plastic tubing over which concrete will again be poured. If you’ve ever stepped barefoot on concrete in winter or summer, you know what a strong conductor of heat it can be. And, so, it will be the same in Aztec Student Union. 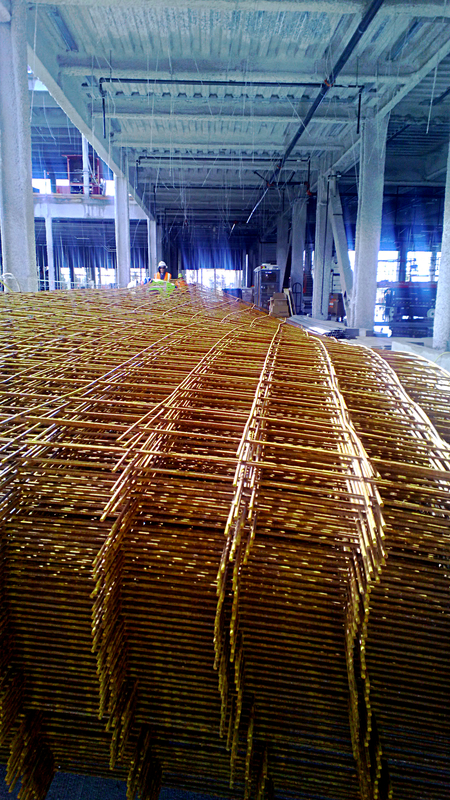 A large stack of wire mesh awaits its installation. To provide cooling and heating, the plastic tubing will be filled with either warm or cool water depending on what the building’s system needs. This system, along with other elements like operable windows and the green roof, will help keep the building’s temperature at a comfortable level throughout the year. A roll of plastic sheeting rests on the bars for the built-in booth seating in the cafe/dining area. Interesting in keeping up with all things Aztec Student Union? Be sure to “like” the project on Facebook, follow it on Twitter or visit the website‘s What’s New section or watch the live construction camera. 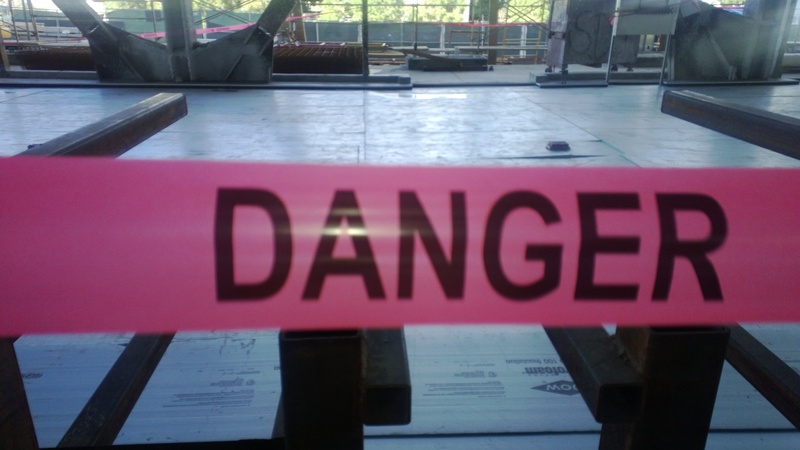 This entry was posted in Construction and tagged LEED, sustainable construction. Bookmark the permalink.